Happy Friday everyone! I hope you have had a good week and are now looking forward to the weekend. 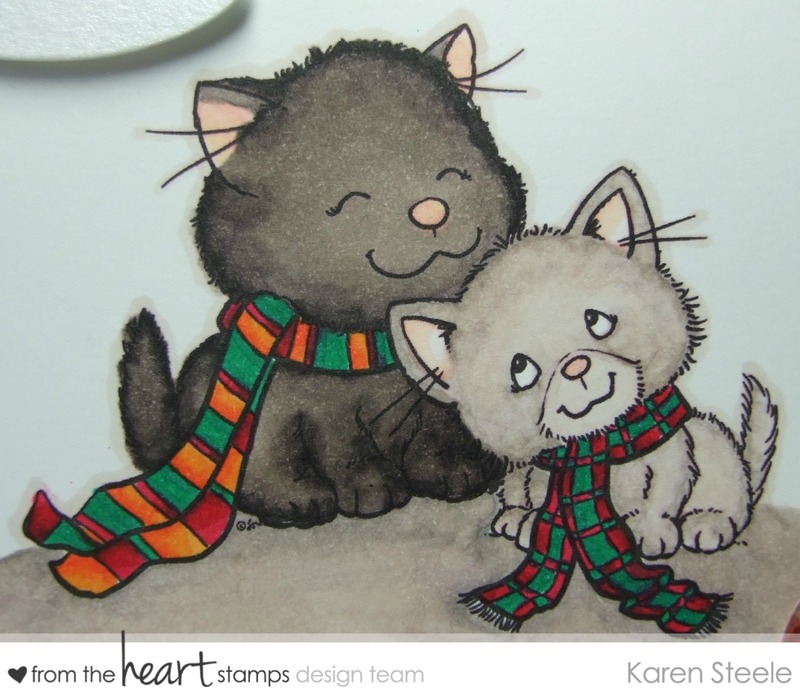 Today I’m sharing this card that I have made for my DT post over at From the Heart Stamps using January’s Stamp of the Month called Cozy Kittens. You have until the end of the month to link up your creations using this super sweet image. If you didn’t get this free at the start of this month as part of our progressive challenge you can purchase it in the STORE now which would mean that you will receive next month’s image for free via email. Or, if you spend $10 in the store you can grab a code that means you can get this image for free! If you need to know any more details about our Stamp of the Month Challenge you can find them HERE. I used a die-cut sentiment from my stash here as I wasn’t really sure for what occasion this card was going to be for! You get 4 sentiments included with the image but I thought by putting this particular sentiment on it would mean I could use it for any occasion! That’s the great thing about these kittens – it can be used for almost any occasion making it so versatile! Other supplies used were: Crate Paper – Farmhouse, Spellbinders Square Dies, Epoxy sticker, Craftwork Cards sentiment and Spectrum Noirs to colour. Why not pop over to the BLOG to see what inspirational ways the DT have come up with using this fab set? There are also some super new images in the store to check out. < Previous One Man and his dog…. Such a darling card with the kittens! Wonderful coloring and great design, too! Lovely card, Karen. Like your layout and your coloring of the sweet kitties are great ! Precious! Love the idea of a any occasion sentiment – great idea! ACK… They are so cute! Your coloring is wonderful, the fur looks so life like. Adorable! I love your sweet card and beautifully colored kitties! Is this cute or what! I love cats! I really like that little embellie you made matching the background paper!